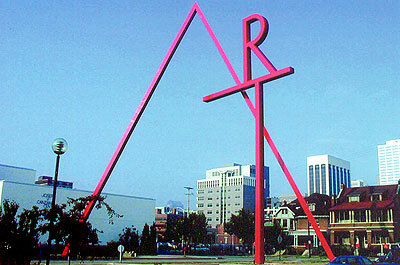 ART is a 100ft tall, 31 ton, bright red steel sculpture that (when viewed standing east of the sculpture, facing west) spells the word ""art"". Two legs make up the ""A"". The pinnacle reaches 100ft; at the base, the legs span 101ft across a downtown Columbus street. The ""R"" sits on the top of the ""T"", with the top of the ""R"" reaching 85 feet. The ""RT"" piece is situated just east of the north leg of the ""A"". The cross section of the ""T"" is 65 feet high and stretches toward the center of the two legs of the ""A"". Vehicles and pedestrians travel under ART. : Doris Shlayn, “ART,” Ohio Outdoor Sculpture Inventory, accessed April 18, 2019, http://oosi.sculpturecenter.org/items/show/1060.